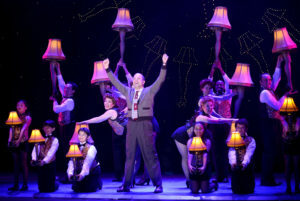 Tags: A Christmas Story, Jean Shepherd, The Musical"
“A Christmas Story, The Musical” – Courtesy of Broadway in Indianapolis. Used by permission. Unless you have been living on another planet, you have no doubt seen the 1983 film, “A Christmas Story” and viewed it multiple times during the holidays on TV. 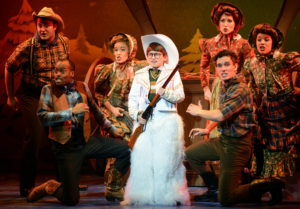 Its worthy descendant, “A Christmas Story, The Musical,” featuring a national touring company is directed by Matt Lenz. Now playing at the Old National Centre’s Murat Theatre, it’s a Broadway in Indianapolis presentation. I attended Tuesday’s nearly sold-out opening night performance. The musical, which premiered on Broadway in 2012, features a score by the composer/lyricist team Benj Pasek and Justin Paul, the songwriting team behind the smash hit Tony Award-winning musical “Dear Evan Hansen” and the Academy Award-winning film “La La Land.” With a book by Joseph Robinette, the story is based on the writings of radio humorist Jean Shepherd and the film. Set in fictional Hohman, Indiana in the 1940s, the story follows the exploits of youngster Ralphie Parker, who spends most of his time dodging a bully and dreaming of his ideal Christmas gift, a “Red Ryder air rifle.” Frequently at odds with his cantankerous dad, but comforted by his loving mother, Ralphie struggles to make it to Christmas Day as he obsesses about the BB rifle of his dreams. Happily, for those who love the film, the musical faithfully follows the movie. It’s all there—the old man’s leg lamp, Flick’s tongue stuck to the flag pole, the mean Santa, and, of course, the bloodhounds (two actual ones) absconding with the family’s Christmas dinner turkey. A definite enhancement of the film are Pasek and Paul’s catchy, witty and joyous songs and associated production numbers that fill out the hilarious story, with titles that are self-explanatory. They include “When You’re a Wimp,” sung by the kids being harassed by bully Scut Farkus; “A Major Award,” during which The Old Man and his neighbors celebrate his winning the infamous leg lamp; “Ralphie to the Rescue,” a dream sequence in which Ralphie saves the day by rescuing people; and “Somewhere Hovering Over Indiana,” during which Ralph, Randy and the kids convey their excitement about the arrival of Santa. The cast principals all excelled at capturing the essence of their film counterparts. They included Chris Carsten as Jean Shepherd, the narrator; Tristan Klaphake as Ralphie; Sara Zoe Budnik as Mother; Evan Christy as Randy; and Paul Nobrega as The Old Man. The entire ensemble featured high-caliber actor-singer-dancers, but most impressive was the large group of incredibly talented children in the cast. My favorite production number in the show was a fantasy sequence featuring Ralphie, the kids and Miss Shields (Angelica Richie), their teacher executing Warren Carlyle’s snappy choreography. 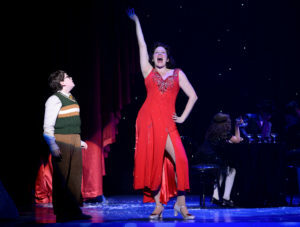 Set in a 1930s speakeasy, Miss Shields dressed in a flaming red gown, the girls in black, sequined dresses and the boys in tuxedos, they tap dance to “You’ll Shoot Your Eye Out,” which for me, was a delightful highlight of the show. Based on the audible response of the enthusiastic audience, it was certainly theirs too. Another star of the show is the cutaway set that depicts the Parker family home designed by Walt Spangler. Providing period authenticity are Liza Zinni and Michael McDonald’s with their pitch-perfect 40s era costumes and Gerard Kelly’s hair and wig design. It is generally recognized that the reason “A Christmas Story,” both the film and the musical, enjoys longevity is because its themes of familial love and the foibles associated with family dynamic are universal, as well as its celebration of Christmas and message of hope which resound with the faithful. With its depiction of a simpler time when family activities didn’t involve each member focused on their smartphones, “A Christmas Story, The Musical” is a revelation for young people who have grown up with technology and nostalgic for the older crowd. It also reminds one of how important human interaction is and how crucial it is to remain present and make family memories that can be savored for many years to come. “A Christmas Story, The Musical” plays Old National Centre through Sunday December 3. The performance schedule is Tuesday through Thursday at 7:30 p.m., Friday & Saturday at 8 p.m., Saturday matinee at 2 p.m., Sunday matinee at 1 p.m., and Sunday evening at 6:30 p.m. Tickets are available in person at Clowes Memorial Hall, the Old National Centre Ticket Office, online at BroadwayinIndianapolis.com, or by phone at 1-800-982-2787.